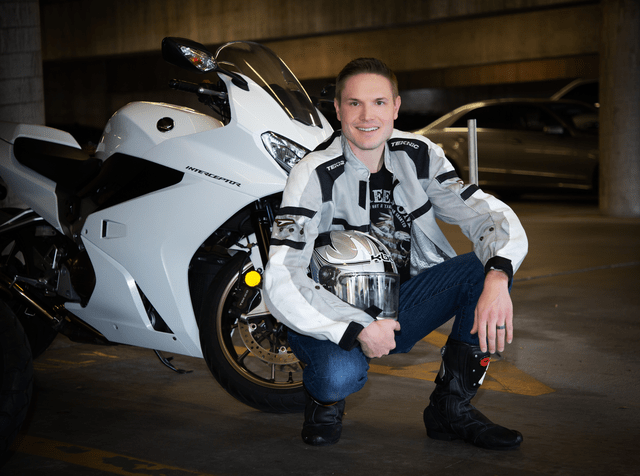 Michael Jeandron an award winning trial attorney and a licensed motorcycle rider. As an attorney, Michael fights exclusively on the side of those who were injured or for the family of those of have lost a loved one. Michael’s trial record speaks for itself, with success against some of the biggest law firms, most powerful corporations, and well financed insurance companies in the country. He has obtained several seven figure jury verdicts for seriously injured motorcycle riders. In 2018, the National Trial Lawyers Association named Michael one of the top 40 Under 40 civil trial lawyers. Prior to becoming a motorcycle attorney, Michael worked as the spokesman for the Riverside County District Attorney’s Office. In that role, Michael saw the devastation caused by drunk driving and developed a passion for helping those injured or killed by drunk drivers. Michael brings that perspective to many of his cases by demanding the drunk driver take full responsibility. Michael has successfully handled civil lawsuits against drunk drivers even though the drunk driver sat in prison for the duration of the entire lawsuit. Michael was born and raised in the Inland Empire and graduated from Palm Desert High School. He has a bachelor’s degree from UCLA and received his Juris Doctorate from Western State University College of Law. Michael is married with one daughter and twin sons. In his free time, you’ll find him watching a Lakers game or swimming with his kids.